Julie Yip-Williams’ life story was intense before she was diagnosed with terminal cancer at 37. So she started a blog about living while dying, looking back at her childhood experiences as a refugee from Vietnam, her struggles with blindness, and her path to graduating from Harvard Law. Bringing together Yip-Williams’ writing from her final five years, The Unwinding of the Miracle bears witness to her sadness and anger, as well as her tender feelings for her young children. Though she never claimed to be at peace with death, Yip-Williams’ book is a parting gift that left us in awe of the depths of human strength. When lawyer Yip-Williams was diagnosed with stage-IV colon cancer at the age of 37 in 2013, she decided to write her story, which resulted in this inspiring and remarkable work that chronicles her immigration to the U.S. and her final five years. Born in Vietnam with congenital cataracts, Yip-Williams writes that her grandmother who deemed her a burden to the family had found an herbalist she hoped would administer a potion to put the infant to "sleep forever." He refused, and Yip-Williams's ethnic Chinese family later moved to Hong Kong, where a Catholic charity sponsored their relocation to California, where Yip-Williams was raised and underwent corrective eye surgery. She attended Harvard Law School, joined a firm where she met her husband, moved to Brooklyn, and had two children. After her diagnosis, she was determined to make the most of the time left (she died in March 2018), and to leave a written legacy for her daughters. Yip-Williams faced cancer head on, with "brutal honesty," anger, humor, and resolve. Planning her death, she made Costco runs, traveled to the Galapagos Islands, found a child psychologist for her daughters ages six and eight, and even joked about her husband getting a "Slutty Second Wife." 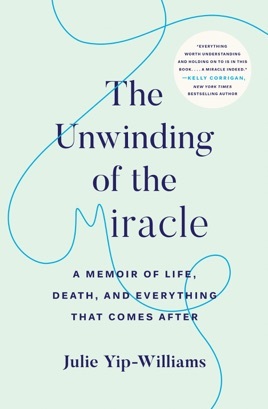 Yip-Williams's wise and moving account of her battle with cancer is an extraordinary call to live wholeheartedly. A very powerful book written with passion, strength and a touch of humor. Julie writes not a story but a lesson in life.